Getting to Know ArcGIS provides a comprehensive understanding of all the tools and functionality available in ArcGIS 10.3.1 for Desktop. Redlands, California—Learn the fundamentals of making digital maps, analyzing geospatial data, and building and editing spatial databases using the workbook Getting to Know ArcGIS, fourth edition, published by Esri. Updated for use with the latest version of Esri's ArcGIS for Desktop software, Getting to Know ArcGIS teaches geographic information system (GIS) concepts and common tasks such as how to find GIS data online, create a web map, set map projections, symbolize and label maps, edit data, and geocode addresses. The workbook also provides a preview of the new ArcGIS for Desktop ArcGIS Pro application. ArcGIS Pro is a new application for quickly creating and working with spatial data on your desktop. It includes scientific tools for spatial analysis, along with the capabilities needed to create and publish 2D and 3D content and to share maps in ArcGIS Online or on an internal server portal. The workbook, which provides a comprehensive understanding of all the tools and functionality available in ArcGIS 10.3.1 for Desktop, can be used in classroom settings or for on-the-job training. The data for working through the exercises and a 180-day free trial of ArcGIS are available for download at Esri's Book Resources website at esripress.esri.com/bookresources. Getting to Know ArcGIS was written by Michael Law and Amy Collins. Law is a cartographer with more than 10 years of professional GIS experience. He has worked for Rand McNally Canada and for Esri, where he developed cartography for books and edited and tested GIS workbooks. Collins is a writer and editor who has worked with GIS for 13 years. She is a former technical editor at Esri, where she honed her knowledge of GIS and designed instructional materials for budding GIS professionals. 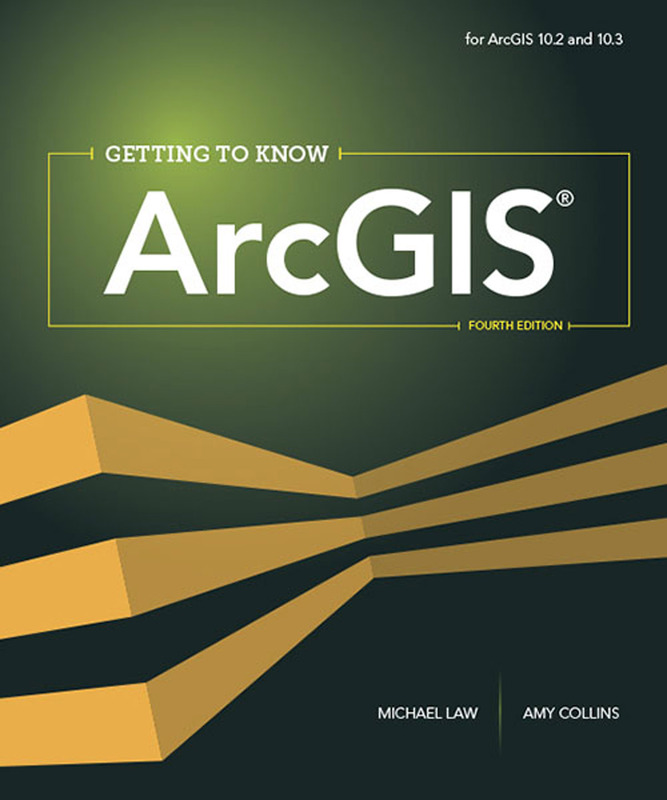 Getting to Know ArcGIS is available in print (ISBN: 9781589483828, 808 pages, US$84.99) or as an e-book (ISBN: 9781589484283, US$64.99). The book is available at online retailers worldwide, at esri.com/esripress, or by calling 1-800-447-9778. If outside the United States, visit esri.com/esripressorders for complete ordering options, or visit esri.com/distributors to contact your local Esri distributor. Interested retailers can contact Esri Press book distributor Ingram Publisher Services.